New Delhi(PTI): Prime Minister Narendra Modi today embarked on a three-nation tour of Portugal, the US and the Netherlands during which he will hold talks with the top leadership of those countries to boost bilateral ties. The highlight of his four-day visit will be the US leg as Modi will be meeting President Donald Trump for the first time on June 26 in Washington. Ahead of his US visit, Modi said he looked forward to the opportunity of having an in-depth exchange of views. “My USA visit is aimed at deepening ties between our nations. Strong India-USA ties benefit our nations & the world,” he had tweeted. In a statement posted on Facebook, Modi said his two-day visit to Washington from June 25 was at the invitation of Trump. Apart from official meetings with Trump and his cabinet colleagues, Modi will be meeting some prominent American CEOs. 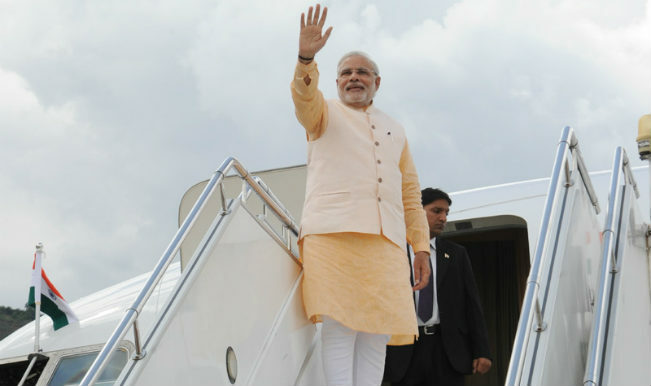 In the first leg of the tour, Modi will visit Portugal where he will have talks with Prime Minister Antonio Costa. “Building on our recent discussions, we will review the progress of various joint initiatives and decisions,” he said about his upcoming meeting with Costa. After the US visit, Modi will travel to the Netherlands on June 27 where he will have a meeting with the Dutch Prime Minister Mark Rutte and call on King Willem-Alexander and meet Queen Maxima. This year, the two countries are celebrating 70 years of the establishment of Indo-Dutch diplomatic relations. “I look forward to meeting Prime Minister Rutte and reviewing our bilateral relations.